Less than a month into its term on the United Nations (UN) Security Council, South Africa faces a potential trial by fire which could set the tone for the rest of the country’s two-year term. As post-election developments continue to unfold in the Democratic Republic of the Congo (DRC), South African diplomats must navigate complex foreign policy considerations to prove the country is a principled and capable regional anchor state. Research by the Institute for Security Studies (ISS) last year found that South Africa’s election to the council comes at a time when the country’s international influence is perceived to have declined. Despite this, South Africa is still regarded as a natural leader on almost every African file before the Security Council. This view was particularly pronounced with respect to the DRC, given South Africa’s long-standing role in supporting its stability. Following South Africa’s eventual support for the UN General Assembly resolution condemning human rights violations in Myanmar last year, international relations minister Lindiwe Sisulu said this was a ‘demonstration of a new dawn in South African foreign policy’ and a return to its ‘founding principles of standing against human rights violations’. She said stability in southern Africa remained a key priority for South Africa. Provisional election results in the DRC which declared opposition leader Félix Tshisekedi the winner on 10 January led to runner-up candidate Martin Fayulu seeking a recount. The country’s influential Catholic Church also noted that the results from the National Electoral Commission (CENI) didn’t correspond with the data of its 40 000 election monitors. The AU called for the announcement of the final results to be suspended, stressing the urgent need to dispatch a high-level delegation to the DRC to get consensus on a way out of the country’s ‘post-electoral crisis’. SADC didn’t allude to the intervention. It instead emphasised the generally peaceful polls, and the need for international actors to respect the country’s sovereignty, constitution and internal institutional processes. South Africa has since congratulated Tshisekedi and largely mirrored SADC’s official position, with no reference made to the AU’s diplomatic intervention and calls to suspend the announcement of final results. The implications for South Africa on the Security Council relate to the country’s ability to ensure consensus among African council members. Also being tested are broader perceptions of its ability to work through regional organisations to establish a clear, well-coordinated strategy to deal with the DRC’s post-electoral instability. Most recently, AU Commission chairperson Moussa Faki Mahamat said the confirmation of the election results by DRC’s Constitutional Court meant the planned high-level delegation to DRC would be postponed. This appears to be a shift by the AU towards a more SADC-aligned position. 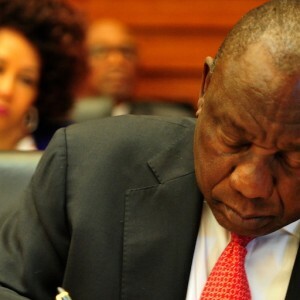 In one of its first such council sittings, South Africa failed to ensure an African consensus on the matter – Côte d’Ivoire was in favour of the press statement along with the United States, the United Kingdom and Belgium. South Africa argued that the council should reserve all action and judgement after the CENI announced the results. In a second council meeting on 11 January, South Africa welcomed the results and commended the CENI’s work. South Africa will be tested over the coming months, especially when developments in the DRC feature on the council’s agenda. Whether South Africa can definitively set the agenda and bolster its credibility on the global stage remains to be seen. What is certain is that the DRC provides a clear opportunity for South Africa to set the tone of its two-year term on the council.